Avocado Green Pillow Review - A Non Toxic Natural Pillow for Better Sleep? In some ways, a pillow is the most intimate sleep accessory we use. We hug them, rub our faces into them, drool on them… So, when it’s time to buy a new pillow, it’s worth finding out if its materials are natural and compatible with your body. In this review, I’ll be testing the Green Pillow from Avocado (can you already tell it’s natural?) in every sleeping position to find out exactly what this pillow is made of, and which sleepers can benefit the most! Too busy to read the full review? Click here to skip to the review summary! WHAT’S THE AVOCADO PILLOW MADE OF? The cover fabric of this pillow is made with a 100% GOTS organic certified cotton cover. Essentially, this means that the top layer of the cover fabric is made from two layers of organic cotton and the layer below that is made from a polyester stretch knit. This combination is intended to increase the overall durability of the pillow’s cover. The zipper is very discreetly located on the opposite side from the company’s logo and can be used to access the internal fill. This is definitely a feature I look for as it allows sleepers to adjust the filling to match their support preferences. According to the folks at Avocado, these pillows are intentionally overstuffed so that sleepers have extra filling to play with when it’s time to go in and adjust it. 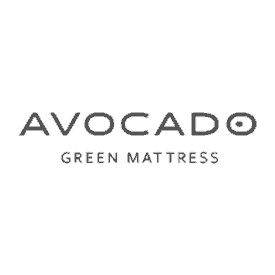 The Avocado Green Pillow is filled with an even mix of 100% natural Dunlop latex shreds and a natural tree fiber called Kapok, both of which are eco-INSTITUT certified. The fill materials are all made from sustainably harvested organic sources which sleep temperature-neutral. The shredded ribbons of latex are known for making a resilient, high-performance fill that offers durability and quick response to pressure. 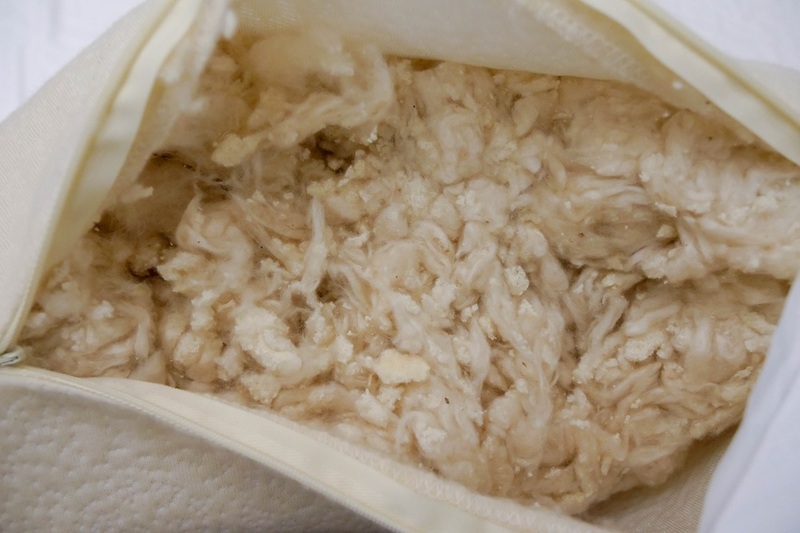 The natural Kapok fiber (which comes from the Ceiba tree) is a fluffy down alternative that is non-toxic, biodegradable, hypoallergenic and grown pesticide-free. Basically, if this pillow could talk, it would tell you it’s Vegan. This pillow is designed to conform to every body type and sleeping style. Basically, this pillow was built with all sleepers in mind. The Avocado Green Pillow is designed to feel soft and fluffy like down, but slightly more dense and supportive. As I mentioned, these pillows are generously stuffed so that you can adjust the loft according to your liking. As a back and side sleeper, I prefer a very supportive and full pillow — so I left every bit of that voluptuous stuffing inside the Avocado. The minds at Avocado designed this pillow to be temperature-neutral which means it’s not a cooling pillow, it just sort of adjusts to your body’s temperature to keep you comfortable. I found that the fabric was initially cool to the touch. After about 10 minutes of resting my face on the pillow, it had absorbed some of my body temperature and got a bit warmer. It never got overly warm and I certainly never felt uncomfortable, but I did feel like the pillow trapped heat a little bit. This pillow offers good pressure relief in all sleeping positions. 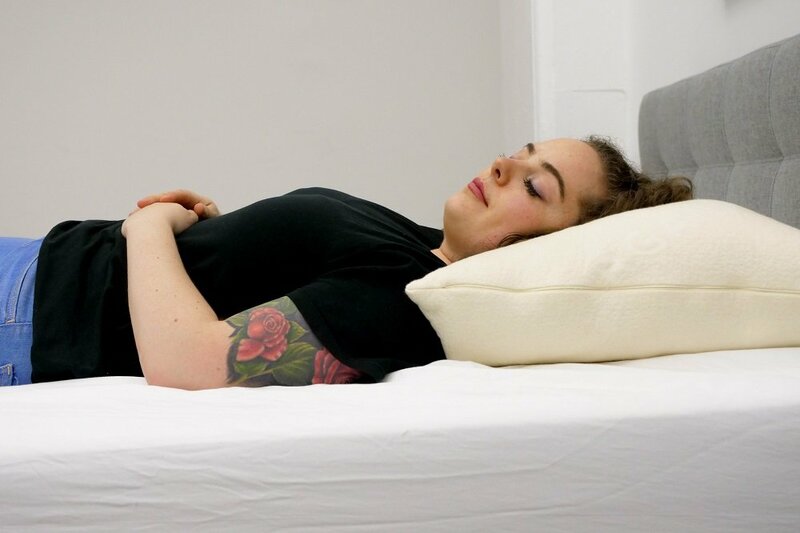 The nature of the fill material is to be supportive and resilient, so the pillow gently contours to your head and neck no matter which position you roll into. It doesn’t come with any particular firmness rating because it’s adjustable, but when the pillow is fully stuffed it feels comparable to medium-firm. I was excited to try this pillow because I do love the idea of natural, eco-conscious sleep accessories. After unpacking the Avocado, it needed about two minutes to breathe and some enlivening fluffs to bring the pillow out of its packaging hangover. Once it was ready to go, I could tell right away that this was a buoyantly fluffy pillow just aching to be tested in every position. The first thing I noticed was how soft the cover fabric is. 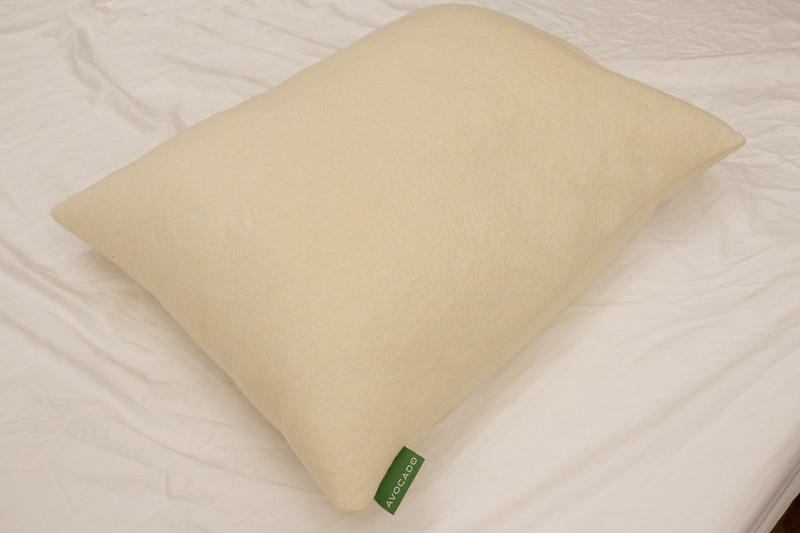 The organic cotton makes the pillow feel smooth, light and breathable and even though I would probably dress it with a pillowcase, the cover fabric itself feels very nice on my skin. I don’t have any allergies, but I do have sensitive skin and I didn’t have any negative reactions to this material. Even before laying down on it, I could feel the pillow eagerly conforming to the shape of my hands and arms. I’m a back and side sleeper, typically falling asleep on my back and then rolling onto my side during the course of the night. So, I tried the Avocado on my back first. As I mentioned, Avocado overstuffs its pillows and I found that to be beneficial for this position. My head sunk into the plush face of the pillow, but not in that trapped way that I sometimes feel with memory foam. My head felt gently cradled, and my neck felt supported; this was my favorite position for this pillow. If you’re like me, you don’t always sleep with your nose directly pointed upwards when you’re sleeping on your back — it’s nice to be able to rest your head to one side or the other. With less supportive pillows, this can be tricky as it’s easy to let your neck fall into a strained position. With this pillow, however, I felt so supported on all sides that I could totally let my head rest to the left or right without feeling like my neck was out of alignment. Following the general flow of my sleeping habits, I moved onto my side next. Again, it didn’t take long to find a comfortable posture; this pillow is very soft and cozy. However, I typically prefer a bit more support when sleeping in the lateral position so I did reach into the pillow and sort of push the filling down into the side on which I was resting. Sure enough, after I made the adjustment to the right side of the pillow, my Avocado and I were back in business. With this pillow, I found that you can pretty much find the right support for any position as long as you’re willing to play around with the fill. Now, you might not want to be up at three in the morning moving shreds of latex and Kapok fiber around in order to get comfortable, so I suggest you find out ahead of time what level of loft is best for you. While, I’m not generally a stomach sleeper, I found this pillow to have good prone position potential. The first thing I noted was that the loft is too high with all of the filling in; I would definitely recommend that stomach sleepers remove some of the internal fill before sleeping on it. When it comes to stomach sleeping, you want to use a thinner, softer pillow so that your head is not too elevated and your neck is not strained. Once I removed about half of the filling and then smoothed it into an even distribution, I found the prone position to be surprisingly comfortable. The pillow itself is very fluffy and huggable, so I was able to find a kind of stomach-sleeping-sweetspot wherein my arms were embracing the underside of the pillow and my head was fully supported. Last but not least, I tested the Avocado’s performance as between-the-leg support and I found this pillow to be pretty nice for this use. It’s full, fluffy, conforms to my body, and keeps my hips and my lower back supported. The medium-plush nature of the latex/Kapok mix provides a good combination of soft and supportive. One thing about this pillow that I found to be less than desirable was the slight rubbery smell it emitted. It’s not the same chemical odor that comes from, say, memory foam off-gassing, however, there is definitely a rubbery/latex smell to this pillow for the first several nights. After a few nights, the pillow had absorbed my natural scents and the rubbery smell disappeared. Overall, I’m a big fan of this pillow. As I said, I found the supine position to be the most comfortable and required the least amount of adjustment. However, I think the Avocado Green Pillow could be beneficial for any style of sleeper who is willing to play around with the filling and adjust the loft a bit. These pillows are designed in Hoboken, NJ and handmade in California. 100-night trial — if this pillow isn’t for you, send it on back for a full refund. WHO WOULD LOVE THIS PILLOW? Are Vegan — If you love the feel of down, but are not trying to sleep on any animal products, you might love the feel of Kapok. It’s fluffy like down, but doesn’t enlist the help of any of our winged friends. Combo Sleepers — This is a great pillow for folks who like to switch up their sleeping positions. The fill is totally adjustable, so you can fix the pillow’s loft according to which position you want to sleep in at the time. Want a Temperature-Neutral Pillow — Cooling pillows are increasingly popular, but many sleepers still prefer a pillow that’s neither warm nor cool. This pillow adapts to your body temperature so you’re comfortable rather than cool. Head over to Avocado to purchase your Avocado Green Pillow!